Archive will be available free of charge at the Wiener Library in London, world's oldest Holocaust memorial institution. LONDON – The British public will soon be able to access digital records from the Holocaust containing 50 million digital records and covering 17.5 million people from the archive of the International Tracing Service (ITS). Available for the first time, the digital archive will be available free of charge at the Wiener Library (www.wienerlibrary.co.uk) in London, the world’s oldest Holocaust memorial institution. The library already hosts the UK’s largest collection of personal papers and testimonies of refugees and Holocaust survivors. The ITS archive contains records from concentration, slave labor and displaced persons’ camps from the Nazi era, World War II and the 10 years that followed. 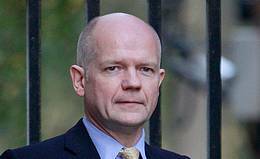 “The ITS archive is hugely significant,” Foreign Secretary William Hague said ahead of the UK launch. “Allowing the British public access to the archive in the UK for the first time will enable Holocaust survivors, refugees and their descendants to obtain information about the fate of their relatives who suffered at the hands of the Nazis. Anne Webber, chair of the ITS Stakeholder Group said: “It has long been an urgent humanitarian need for people in the UK to have the opportunity to discover the fate of their loved ones, even at this late hour. “Since the archive has opened, brothers have found sisters; sons have found mothers, each of whom had never known the other had survived. This is the foremost collection of material on the Holocaust and its aftermath, and having a copy in the UK will provide scholars and educators with a vital resource to research, study and teach one of the defining episodes in human history,” Webber said.